As dishwasher racks age, so do their parts. Sure, sometimes you have to replace moving parts, and with years of usage the heavy coating on the racks begins to deteriorate and fall off. This doesn’t affect the way the dishwasher runs, but it does reveal the metal rack structure underneath. Exposed to water, the metal racks begin to rust. A rusting dishwasher rack begins to “bleed” out with each wash cyle. What results is a discoloring of your dishes. In other words you have dishes with rust stains – not good! Worse, the exposed wires can scratch your dishes. You might think you need to replace the dishwasher rack (never mind, the whole dishwasher! ), but that can be expensive. This is especially true with the major brands like Whirlpool, Kenmore, Maytag or Bosch. The good news is that they make a perfect little repair kit just for this age-related problem – dishwasher rack caps you can glue on to repair your rusting dishwasher rack. Read further to see how easy and cheap this fix can be. Your dishes will thank you. It’s nice to know there is solution that’s simple to use and actually works well. And for under 10 bucks, it doesn’t get much cheaper. It’s called Dishwasher Rack Paint and Glue. It comes as a kit with little protective caps that do the job of covering rusted tines and protecting it and everything around it. A kit like the one shown is a good product to use to make this repair. Gluing on the caps is pretty easy, and they even come in a few colors so you’re sure to match your rack closely enough. Definitely use the glue that comes with this kit. Trying to affix the caps with even the best glue gun just isn’t going to cut it in the dishwasher’s moist, hot environment! The first step is to pull out the rusted dishwasher rack far as it will go. If you wish, you can remove it from the dishwasher completely and place it on an even surface somewhere where it’s easy to work on. Let it air dry or wipe down the rack thoroughly until there is no moisture present on any surfaces. The second step you should do depends on your rack and how much your rusted and corroded wire tines are exposed. You want to have a clean and smooth surface on these before moving on. You can get this by wiping the tines with an abrasive surface like the backside of a dual-purpose kitchen sponge. Sand paper also works well. Just be sure to wipe away and remaining dust. The third and final step is gluing and attaching caps. 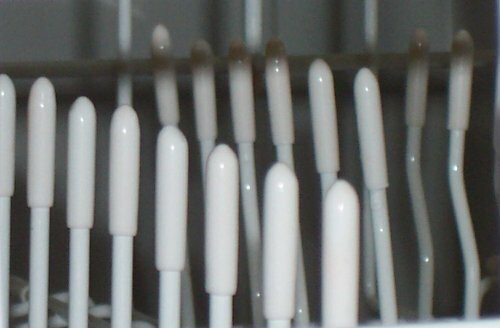 The dishwasher rack repair kit will come with two basic parts – a glue (or goop) and the actual caps for the tines. As you might guess, you’re going to apply the glue and place the caps over the top. The glue is very fast-drying. This is good, as it helps to create a firm hold once the caps are in place. But this also means you want to work quickly…but carefully. Just make sure you have plenty of light to see while you apply it and the space to move easily and freely as you work. It’s also a good idea to have a damp rag or paper towel handy in case of any dripping or accidental touching with the glue applicator. Have the cap that your about to place on the tine ready to go, so as soon as you put the glue on you can push on the cap. One small tip is to not breathe too deeply or closely to the glue/goop – it has a strong odor, but nothing to worry about – just be aware of this. Again, the dishwasher rack repair kit pictured is just an example. It gets really good reviews at Amazon, which you can check out for yourself. The kit comes with detailed instructions and even a non-latex glove to use. Since the kits are so inexpensive, it is recommended to buy two of them. You may not need the extra caps, but the extra glue/goop in the second kit may be needed depending on how many tines you’re repairing rusted tine on your rack. You can also buy just the glue bottle separately so you don’t run out. Yes, a name like “Uber Goop” is a funny name, but it’s not a gimmick as one reviewer points out – it just works! ***Of course, if you don’t mind spending a little extra money, you can find a new rack to really make things feel like new again. 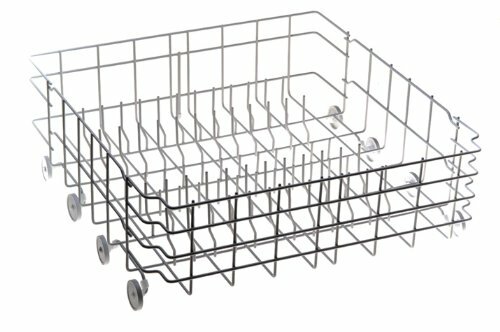 Brands such as whirlpool, Frigidaire, GE offer racks like this one to replace rusted or damaged ones. in my dishwasher it is not just the tips of the tines but also small areas of the rack where plates sit. Will applying the goop coat the wire rack in these areas or would you suggest cutting a piece of the tip and glue it around the rusted areas? Use just the goop coat for those areas. It may take more than one coat, and over time you’ll need to reapply. Just part of dealing with an older rack that is rusting. 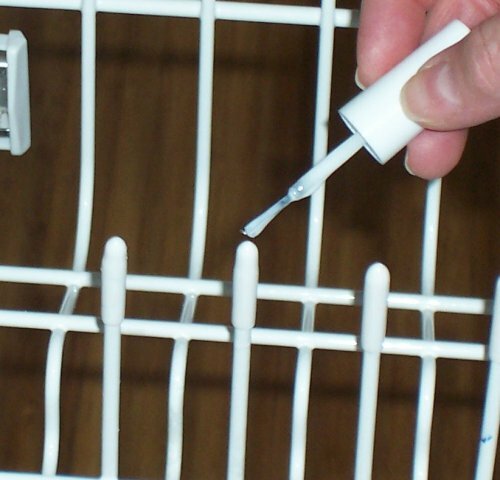 This product works, but your best bet is just not to buy a dishwasher manufactured by the Whirlpool company (several brands including Sears)––or you’ll be forever “touching up” these racks. I had a ’60s Kitchenaid that finally wore out after a number of easy home repairs. This Whirlpool is just THREE years old and failing! The thin polyvinyl coating is porous and allows the non-stainless steel rack underneath to rust and even break off tines altogether. Spoke with Whirlpool and without an “extended warranty” I’m on my own. How is it one set of racks lasted nearly 50 years––and this one only three? Whirlpool engineering cuts too many corners.